Four US Olympic swimmers who said they had been robbed in Rio de Janeiro were not victims of crime, the head of the city’s civil police has said. One guard had drawn his gun after one of the swimmers began behaving erratically, Mr Veloso added. Three of the swimmers remain in Brazil and are being questioned by police. 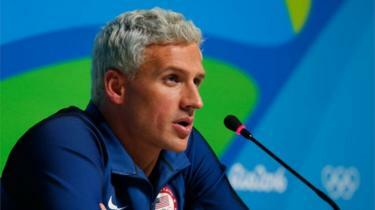 The fourth, gold medallist Ryan Lochte, returned to the US on Monday. Lochte robbery: What do we know? Brazilian police sources had earlier said the men invented a story about a robbery in an effort to disguise a dispute over a damaged bathroom door at the petrol station. The swimmers – who have repeatedly changed their accounts of what happened – could “in theory” face charges of giving false testimony and vandalism, Mr Veloso said. Gunnar Bentz and Jack Conger were taken off a US-bound plane at Rio de Janeiro airport on Wednesday night and were seen entering a Rio police station for questioning on Thursday afternoon. Team-mate James Feigen has also remained in Brazil. What is said to have happened? The Civil Police of Rio de Janeiro earlier told BBC Brasil that at about 06:00 (09:00 GMT) on Sunday, the four men had arrived by taxi at a petrol station in Barra da Tijuca, 16km (10 miles) from the Olympic Park. At least one of the athletes broke the door to the bathroom, the police said, and petrol station attendants asked the Americans to pay for the damage. A verbal dispute is said to have ensued with the attendants, and security guards were called to contain the incident. The police were also called. While police were on their way, another customer at the petrol station served as interpreter for the athletes and helped agree payment for the damage. When police arrived, the athletes had already gone after paying for the broken door, and they returned to the Olympic Village. What have the swimmers said? Mr Lochte admitted on Wednesday to some inaccuracies in his original account of being robbed at gunpoint in the early hours of Sunday, but vehemently denied making the story up. “I wouldn’t make up a story like this nor would the others – as a matter of fact we all feel it makes us look bad,” he told US TV network NBC. News of the incident emerged after Mr Lochte’s mother told US media about it. Mr Lochte himself gave an initial account of the events to NBC on Sunday, saying he and the other swimmers had been in a taxi returning from a club in the early hours when they were pulled over by men wearing police badges. Mr Lochte has since slightly altered his account, telling NBC on Wednesday that the taxi had not been asked to pull over – they had been robbed while making a stop at a petrol station – and he said the gun had not been pointed directly at his forehead. He called the inconsistencies a “traumatic mischaracterisation” caused by the stress of the incident. US Olympic Committee (USOC) spokesman Patrick Sandusky said in a statement that Mr Bentz, Mr Conger and Mr Feigen were co-operating with authorities and looking to speak to them on Thursday. Mr Lochte’s lawyer told the BBC he had returned to the US two days ago before the controversy broke. “He was never asked to remain for further investigation or for any other purpose after he met with Brazilian authorities after he gave a statement,” said Jeffrey Ostrow. Lochte is one of the most successful swimmers in history, with 12 Olympic medals, and he once had his own reality television show in the US. In Rio, he swam in two events, winning gold in the 4x200m freestyle relay.